I've spent the morning baking bread. Sourdough, to be exact. I have tried over the years to make a good loaf of sourdough, and have had many problems getting the starter to work properly. Then I found the Tassajara Bread book, a bread cook book from a Zen monastery in originally printed in 1970s. It is very big on the sponge method of baking, where you mix some of the flour and the yeast etc together and let it sit to proof, before adding the rest of the flour and other ingredients. I had very good results with this as soon as I tried it. My bread looked as it came from a bakery, for the first time (usually the loaves taste fine, but look, well, amateur). For this sourdough bread, you make the starter much as you do with other recipes, but when you get to the bread part, you mix the starter with flour and water, then let it sit overnight before mixing in the rest of the flour. I had a starter going in Texas, but something went wrong - maybe it was too hot, or maybe there were just some very funky yeast spores in the air - but the sponge always ended up smelling more like sulfur than sour mash or beer. I used it anyway, and the bread turned out OK, but not really good. So, I threw out that batch of starter when we left. This week I have been growing a new starter, and it smells just right. Last night I started the sponge, and this morning, it didn't smell bad! Wahoo! It was a bit thinner than the sponges I made in Texas, but since they didn't turn out well, that is probably a good sign. The loaf shaped up and rose nicely. And, you ask, how did it turn out? Really good! It has a lovely color and shape, and it tastes like a nice, light sourdough loaf of bread. Much better than my last couple of attempts in Texas. You know, I named this blog "An Archivists Miscellania," but I have yet to actually say anything about archives. So, today I will provide some tips that can help save you and your descendants some time and trouble. Label your stuff: This goes for everything you want to save/identify in the future, including pictures, computer files, and paper files. If your child can't identify those people in that picture, it will be useless, even if one of the scruffy little boys grew up to be someone interesting, or just their grandfather. Computer files easily disappear if they are not well-labeled. It helps if the file name is related to the contents, and if you fill out the "Properties" field (found under the file tab in Word) with some pertinent details. Dates are always good. The same goes for paper records - if your taxes are filed in a clearly labeled file, and you get audited, they will be much less stressful to find than if they are in a box labeled "old stuff." For your own personal records, there is no right or wrong way to label, but the idea is to make everything accessible and usable. Don't write on the photos when you identify the people in them. This ruins the picture for future generations, and will contribute to its general deterioration. There is no such thing as an archivally safe writing implement. Instead, you can photocopy the picture and write on that, or use a slip of paper that you can keep with the picture. Don't glue photos into an album. Don't use double-sided tape. Don't use those "magnetic" photo albums. Do I really need to explain why? If you intend to become a famous writer someday, and are producing lots of drafts and unpublished manuscripts, for the sanity of your archivist - label them! Give us a title, a date range that you were working on the draft, the order of the drafts, something or anything that will help us organize your papers. You don't need to change the way you work i.e. don't alter the original order, but once in a while, sort through the papers and leave some clues. Don't store your papers in the bathroom. It has been known to happen. As have the various water-related mishaps that occur in bathrooms. Besides being kind of gross, the water can severely damage your materials and encourage mold and insect damage. There. That should do it for today. Just remember, if you want to save it, label it! The other day we went to a Rochester Red Wings baseball game. They are the local minor league team, and are much revered in the area. Since the season is almost over, we figured we ought to go now while the weather is good, rather than waiting until April or May, and possibly get snowed out! It was a nice night - balmy and clear, with a full moon (too early for the eclipse though), and the stadium appeared to be sold out. And, the home team won, which is always a plus (unless of course you are actively rooting for the visiting team, as we usually were at hockey and baseball games in Texas). The great thing about minor league sports is how close you can get to the game. We got almost the best seats in the house (A little to the left would have been a bit better for seeing around the batter and ump, but I'm not quibbling). 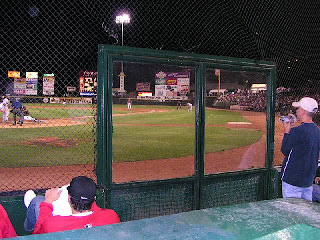 The guys in front of us were scorekeepers for the visiting team - the Pawtucket Red Sox. Otherwise, front row. That's the time it took me to do my tai chi form this morning! For ages I have been stuck between 20 and 25 minutes, far short of the 35 minutes that my teacher requires for the black sash test. This morning, with a combination of doing the right breathing, making myself say the moves and concentrate, and imagining myself moving through molasses, I slowed down to 32 minutes! Wahoo! For years Benjamin has been trying (without much success) to get me to go for bike rides with him. It isn't so much that I don't like riding my bike as is that I don't like riding on big hills (I'm kind of a bike wimp) or in places with traffic. 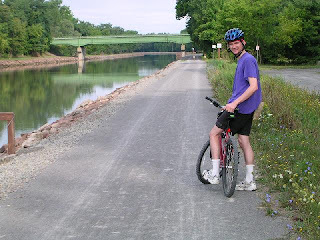 Well, we now have the solution right out our back door - the Erie Canal towpath/bike path. Yesterday we went for a ten-mile early morning ride...and I enjoyed it! It was great - no hills, a smooth path, and best of all - no cars! We went early, hurrying through a brief breakfast, still in Texas mode and trying to beat the heat. We needn't have bothered. It was nice and cool, and because we were out early, the path was practically deserted. By the time we turned around and headed home, more people were out walking dogs and going on family bike rides, but it was still not very busy, compared to Town Lake (now Lady Bird Lake) trail in Austin. 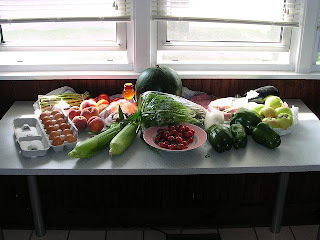 Asparagus ($1.50/bunch), peaches, grape tomatoes, regular tomatoes, eggs, 2 ears of corn, lettuce, apples, 2 eggplants, 4 green peppers ($1.50 total), a watermelon, honey, andouille sausage, a pound of fresh ground beef, and a cinnamon roll. We passed up the giant boxes of tomatoes, peaches and apples, not to mention the multiple varieties of plums, shellfish, pasta, and prepared foods. 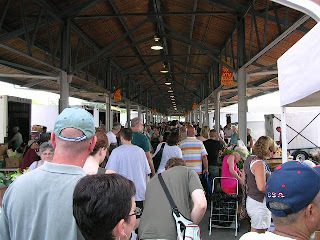 Not to mention the cheese store, coffee store, empanada stand ... We are thinking of going back next week or so to get a large box of tomatoes to can or freeze for the winter. Yum! Yes, stating the obvious - but I am currently a "homemaker" (as my occupation is listed on our new bank account and insurance) and the days sort of run together when you don't have a job. So, it is Friday afternoon, and it is hot. 91 to be exact, and fairly humid, almost Texas humid. We are taking advantage of the warm, sunny weather and going to the beach for a picnic dinner. We have only seen Lake Ontario from a distance up till now, and this seemed like a good day to go. I don't know how cold the water is, but I am willing to bet it is at least as cold as Lake Washington - hypothermia inducing. Ah well, I still plan to get in up to my knees, and may go for an actual swim. I managed to get the insurance changed over today, painlessly! And we got our new bank account set up, almost as painlessly. But, since I am unemployed at the moment (only because I haven't started looking...) I am a homemaker, or as Benjamin sometimes calls it - the little wifey. I don't think I am really suited to being the little wifey though - Benjamin tends to do more of the cooking, and I am not really as good a cleaner as my mother would hope! See, I have too much of my father in me, and her genes aren't really enough to counter the messiness gene. Ah well. It is supposedly a temporary situation. I am putting up a few pictures of our house, mostly so my mom can stop trying to imagine it when I talk to her! This first one is of our living room, taken from the corner. 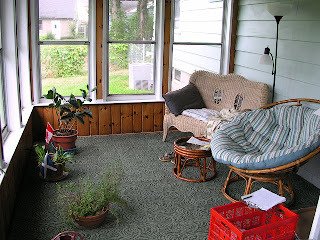 The couch is on the left, in front of the large window that you can see from the external picture a few posts ago. The door of the house is to your left, out of the picture. The visible door on the left goes into the kitchen. 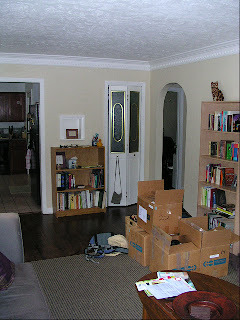 The door in the middle is a coat closet, then the arched doorway on the right leads to the rest of the house. As you can see, we still have some boxes to unpack. This is our screened in porch. All the windows have both glass and screens, so you can close it up all the way, or open it all the way, or any combination in between. At the moment, we have all the plants out there, but some of them will be moving inside, once we figure out where they go and get some new saucers for them. The round chair is ours, the other one goes with the house. Cleo likes to sit on it. The picture is taken from the stairs that lead into the room from the study. My cousin, who lives in Manhattan and went to school in the state, warned me that this part of NY was more like the Midwest than the East Coast, and I can see what he meant, but to me, it feels like a different country altogether. I mean, the town has a Main Street, with little shops, and people walking around. There must be towns in Texas that feel this way, but apart from Fredricksburg, which has a distinctive western vibe to it, I never found any. Adding to the strangeness is the fact that most of the shops are completely different. The grocery store, the phone company, the small restaurants, the gas stations - they are all different. Yes, there are a lot of the same chain stores, but not in the immediate area. We have to drive to Greece (suburb of Rochester, and home to the largest mall this side of the Mississippi) to see those. Not that I mind - it is just different. There are so many things you have to do when you move to a new town and state, and all of them end up rather complicated. Because we are going to be New York residents now, we have to get NY driver's licenses. This does not seem a particularly complicated task in and of itself, but we do have to show several things to the DMV to get it done, one of which is an out-of-state driver's license that shows the date it was issued. Easy enough, I think, and I take out my Texas license and look. Oops. It has the date it expires, but nothing about date issued. So, that means we have to get a "Driver's Record" letter from Texas with that information. Over to the Texas DPS web site, where I finally find the form to order the letter, but it doesn't say exactly what information will be included. I don't want to pay the $4.50 fee, get the letter, and then find out that it won't do the job. An email is sent to customer service, which they promise will be answered in 24 hours, unless it is answered in 48. Sigh. We also have to register the car, which I think will not be a huge problem, but all the information on the web site is geared toward someone who is just buying a car. I am not buying a car and bringing it from out of state. I OWN my car. So I don't know if I have all the proper paperwork or not. And there is no DMV here in Brockport (see garbage pick-up below re services); we have to go to Greece or Rochester. Sigh. Getting garbage pick-up is also complicated here in Brockport. The Village is not really big enough to have its own municipal facilities set up, so you have to contact a company yourself. But, they don't tell you which companies service the area. Luckily, today is garbage day, so I could see the trucks going up and down the street and then find their web site. But why is it so hard for someone to tell me who is available? And how much I should expect to pay? Another email that will be answered in 24 hours, unless it isn't. Sigh. And I won't even go in to phone/cable/internet. It is as difficult here as it is anywhere, if you are trying to get a good deal. I know that getting the bundled package is theoretically a good deal, but I don't want caller ID, a billion channels, or unlimited long distance calling to Europe. I don't make that many phone calls, and don't get that many. I don't want to watch TV for 8 hours a day. I don't know anyone to call in Europe. Sigh. Are a good thing to have when you are moving. It is very easy to bash a knuckle on a doorway when you are carrying a heavy box or hit your hands on cabinets that are in unexpected places in a new kitchen. Benjamin and I have both done this in the last few days. They are also a good thing to have as an archivist, since the number one occupational hazard is paper cuts. The house is great. It is about the same square footage as our last apartment, but feels much bigger. I mean, there are windows on all sides of the house, not just the one that doesn't have neighbors attached. And speaking of neighbors, we have some, but they are not actually touching our walls. We have a great screened in porch (where I am at the moment), and a good sized backyard. The Erie Canal is at the end of the garden, and yes, we have seen a few boats go by. 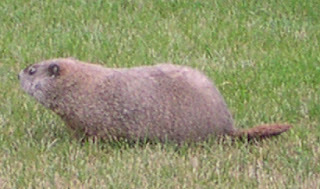 I saw a woodchuck in the yard this morning, strolling and munching his way across the lawn. Somewhere along the way I decided that traveling with cats is a lot like traveling with small children. First there is the gear: You have the special seat (cat carrier), the special food, the diaper bag (litter box). Then there is the attitude: Cats, like small children, do not like being in the carrier, the car, the motel room. They whine and complain. They may throw a tantrum. If you are lucky, they sleep most of the way. If you are unlucky, they get carsick. Then, when released from the vehicle, they wake up and jump all over the bed while you are desperately trying to get some sleep. Cleo is a seasoned traveler, having moved with us to Seattle and back to Texas a couple of summers ago. This does not mean that she likes traveling, just that she seems to know what to expect. Oliver, on the other hand, has never traveled and never lived anywhere but in our one apartment. He quickly discovered that traveling is not fun. Cleo knew that if she protested enough, we would let her out of the carrier to sit on our laps and explore the truck. Last time we moved, she spent most of the time watching semis go by from the back window of the car. In a truck, there are far fewer places for her to go. Day one she spent a bunch of time under the passenger seat. But by day two this was already boring, and she mostly wanted to sit with Benjamin, while he was trying to drive, or on the dashboard. 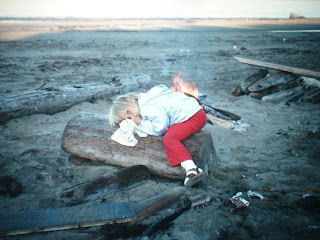 This was not allowed, which made her cranky. She would eventually give up and fall asleep in the carrier, only to reawaken if we went over bumpy roads. Sigh. Oliver spent most of his time looking shocked at his temporary incarceration, although he did relax enough to take a bath on the last day. He wasn't allowed out to explore, partially because it was difficult to open his cage in the truck, and partially because we weren't sure we'd be able to get him back in again. They both had to be dragged from under the bed each morning to be reinserted into their carriers. Sigh. The trek started on Wednesday, with the Loading of the Truck and Cleaning of the Apartment. In these two activities we had some very welcome help - an enormous, thanks to Ian, Woo Young and Louise who schlepped and cleaned far beyond the call of duty or friendship. We wouldn't have been able to get everything done so easily or quickly without their help. I am sure Ian was glad that we were only up one flight of stairs this time, rather than on the third floor with a spiral staircase as we were last time he helped us move - especially when it came to the couch! It turned out we had been very lucky with the weather on Loading Day, because Moving Day dawned in a deluge, thanks to Tropical Storm Erin. Benjamin got drenched running the last few loads out to the truck and hooking up the tow dolly for our car. Meanwhile, in the apartment, I was busy doing the last cleaning tasks. Note 1: If you plan to make snacks, like carrot sticks, for the road, it is good idea to leave a knife and/or vegetable peeler out until you have done so. Note 2: When moving, make sure you leave the cleaning supplies out until the very end. It is much easier to clean when you have the right sponge, brush, and cleanser for the task. Note 3: when planning to make a three-day, cross-country drive in a moving truck, try not to strain your back. I foolishly forgot that note, and ended up with back spasms after scrubbing the grout in the shower. Oops. 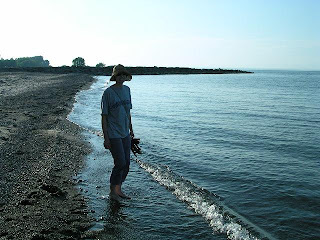 I have been thinking about starting a blog for a while now, but graduate school, work, tai chi practice, dog walking, bassooning and general overscheduling kept me from it. This past weekend, however, Benjamin and I moved from Austin, Texas, where we had been for the past six years, to Brockport, New York. As a result, I am currently unscheduled and have time to get blogging. 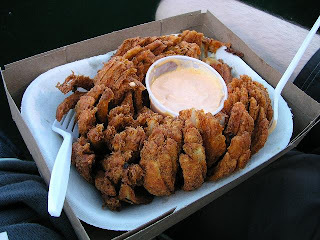 Also, when we were saying goodbye to all our friends in Austin I promised so many people that I would start a blog that I kind of have to now. So, check back soon for the tale of our trek from Austin to Brockport, 1600 miles through seven states in three days with two cats and a 15' truck.